Try to imagine a scenario in which, say, Drew Brees is accused of being a member of the Ku Klux Klan, and the accusation is taken so seriously that the one-time Super Bowl MVP actually has to formally deny it. I mean, Brees is a White man from Texas … and the stereotypical KKK member is a White man from the Southern states … and if you saw a video of a hooded KKK member spitting racist rhetoric who kinda-sorta-maybe looked like Brees you could … nah, still too crazy, right? 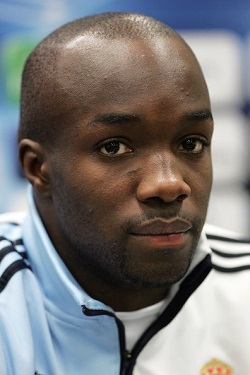 So consider that unlikely scenario when you hear what is happening to French soccer star Lassana Diarra. Currently playing midfield for Lokomotiv Moscow in Russia’s top pro league, the 29-year-old Diarra has also played for international powerhouses Chelsea (England), Arsenal (England) and Real Madrid (Spain) in his career. Earlier this week, Diarra had to formally deny claims that he has taken up arms in Syria fighting alongside Muslim extremists. The ridiculous rumor spread via social media that Diarra had involved himself in Syria’s civil war. The first piece of evidence? Well, Diarra is Muslim. The second piece of evidence? A recent video of a masked man holding an AK-47 and imploring his fellow Muslims to come to Syria and fight on the side of his fellow radical militants. Enough people thought the man looked like Diarra that the video went viral, even though the man’s entire face is covered except for his eyes and the bridge of his nose. The man in the video has since been identified as Abu Isa al-Andalus, and while the title of the video says, “Former Arsenal footballer joins extremist fighters in Syria,” the Arsenal club says they have no record of a former player by that name. This is not only another case of ignorant individuals lumping all Muslims in together with the worst of Muslims, but it also smells like that “They all look alike” attitude often directed at Black people. I’m thinking the same geniuses who believe the man in the video looks like Diarra could also be convinced the man in the video looks like Kevin Garnett or Tracy Morgan. It’s unfortunate that Diarra even had to address these accusations, but such is the price many Muslims pay for practicing their faith in societies that haven’t been educated better.